Last weekend at Silicon Valley Comic Con I premiered my Vice Admiral Amilyn Holdo cosplay. I had a great time wearing this costume from Star Wars: The Last Jedi! Although I’ve been planning this since last year, I only had a few weeks to sew it because I was busy with other events. I will have a follow-up post with more information about the construction, materials, tips and tricks, and a materials list, but for now here are some pictures from the event! This was taken in the lobby of the convention center, not long after arrival. However, before SVCC, my friend Chris Weiner took a few photos in his back yard with his superior camera! The back drape of this dress is what made me fall in love it when I first saw a photo of Lauren Dern as Amilyn Holdo in Vanity Fair Magazine. There were so many great Star Wars cosplayers at SVCC! I met Praetorian Guards, Stormtroopers, and Darth Vader! I also met Kylo Ren, who bowed to his Disney overlords. I was delighted to meet another Holdo. Double Holdo, double trouble! I also encountered General Hux, and we had a stare-off. Lego Obi-Wan was a delight! I even found and ate a stormtrooper macaron cookie. And it was an honor to be one of the cosplays featured on Business Insider! My friend Adrienne took this video of me so you can see how the dress moves as I twirl. SVCC was a lot of fun; I’ll be sure to be back next year! See my Flickr album for more photos from the event. 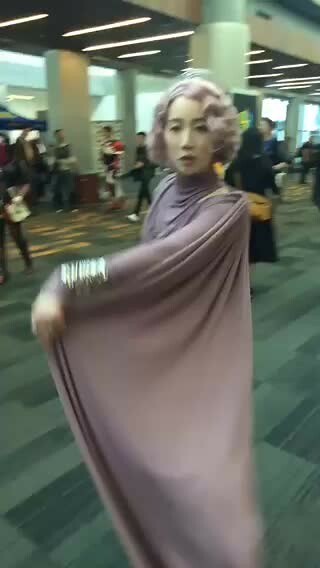 Posted in Cosplay, Geekery and tagged Amilyn Holdo, Cosplay, costume, sewing, Silicon Valley Comic Con, Star Wars, SVCC, The Last Jedi, Vice Admiral Amilyn Holdo. Bookmark the permalink. Oh wow – that turned out fantastic! It looked like an amazing time. Thanks! It was definitely a lot of fun; lots of things to see and do.